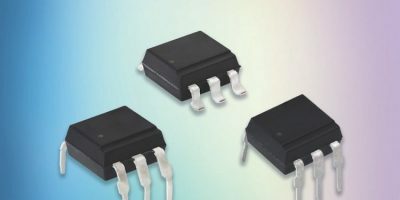 Two series of optocouplers from Vishay Intertechnology offer 800V off-state voltage for noise isolation in industrial equipment and home appliances. Both series of optocouplers have phototriac output in compact DIP-6 and SMD-6 packages featuring high isolation distance on output. The VOT8025A and VOT8125A offer high off-state voltage of 800V and dV/dt of 1000V/micro seconds. The optocouplers isolate low voltage logic from 120, 240 and 380V AC lines to control resistive, inductive, or capacitive loads, including motors, solenoids, high current thyristors, or TRIACs and relays. They save board space and reduce bill of materials cost by having either a GaAs infra red LED optically coupled to either a zero-crossing TRIAC (VOT8025A series) for EMI reduction without the need for external snubber networks, or a random-phase TRIAC (VOT8125A series) to enable phase-independent switching. The high off-state voltages of both the VOT8025A and VOT8125A series enhance safety margins in one-phase applications, continues Vishay, while still maintaining enough voltage headroom for three-phase applications. For additional safety, the optocouplers offer a withstanding isolation voltage of at least 5000V RMS. The high isolation distance on output enables a wider footprint clearance. Low trigger currents of 5mA are claimed to create an easy interface with digital logic. Samples and production quantities of the VOT8025A and VOT8125A are available now, with lead times of six weeks. Vishay Intertechnology manufactures discrete semiconductors (diodes, MOSFETs, and infra red optoelectronics) and passive electronic components (resistors, inductors, and capacitors) for use in electronic devices and equipment in the industrial, computing, automotive, consumer, telecommunications, military, aerospace, power supplies, and medical markets.